The haptic sense can reduce or even eliminate the need for the user to pay attention to a visual display on a device while using it. In addition, the use of computer controlled haptic feedback allows the rich feel of mechanical controls to be re-claimed and combined with the dynamic nature of computer-oriented, graphical user interfaces. As a result, user interface controls with haptic feedback are able to take advantage of the best of both worlds, traditional consumer electronics and computers. The Haptic Chameleon project aims to go one step further however, by developing a family of controls, which combine all the benefits of haptics technology with the ability to change shape and feel. This adds a new dimension to user interface controls by allowing users to physically grasp the meaning of abstract information attached to these controls, such as the mode of operation. 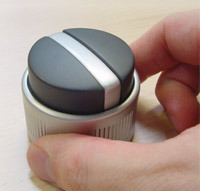 By combining aspects of haptic and tangible user interface concepts we aim to create a completely new user interface paradigm that offers an appealing alternative to current ways of controlling electronic devices by reducing significantly the number of user interface controls required for a given task. Read more about the Haptic Chameleon project in the TRN report.